Sorry this post comes well after the last ones but I have had a sick baby and the holidays means one crazy Momma! Turkey with Fruit Quinoa-YUMMMMY-First I recently discovered quinoa and love it! This was great with hunks of cranberries. 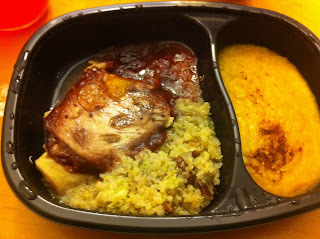 The turkey was tender and moist which is almost unheard of in frozen meals. I loved it. Papa Hunt was a big second on these meals as well! Also lets for a minute discuss the love of the butternut squash side-So good! So Good!! Spinach Ricotta Crepe- So I did not eat this because of the cheese so only Papa Hunt, his verdict if he liked spinach it would be great-He of course did not like it because of the spinach. Oh well can't win them all! Roasted Turkey Breast- Papa Hunt thought this was just ok, I on the other hand thought this was one of the best meals we had. 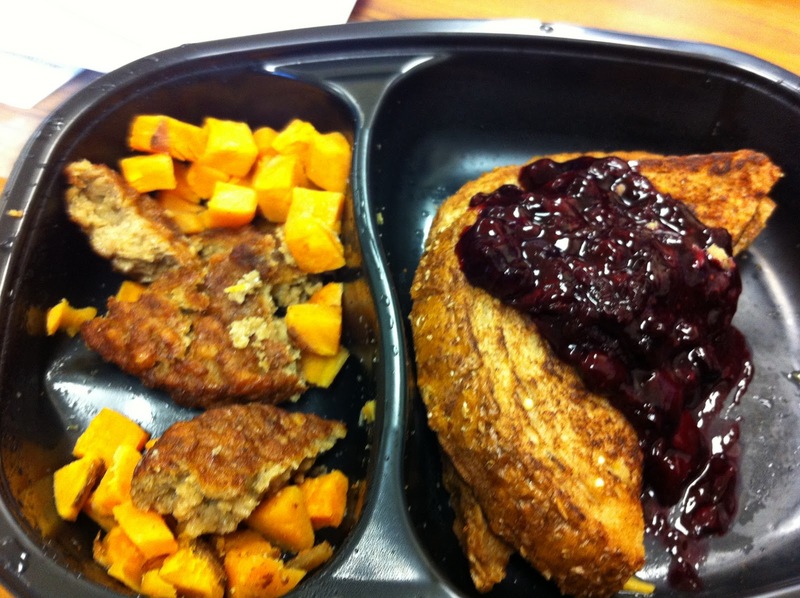 The Turkey was tender and the fruit chutney was so good, it was like a mini thanksgiving. Beef with Broccoli- We both really enjoyed this traditional Chinese food dish. We both have been consistently surprised with the quality of the meat that comes in these meals. I thought it was great that despite the fact that it was frozen it still was tender and had a great sauce. Jungle Chicken Crepe-Only Papa hunt ate this one and he was not a big fan. Nothing per say wrong with the meal just not really his taste for breakfast. A bit too spicy for him and he prefers more of a sweet breakfast. Chicken stuffed with Brown and Wild Rices-This was a nice meal, but not one of the better ones. We thought it lacked some of the other meals rich flavors and needed a little something. I did love the Ratatouille that was served on the side. This hit the spot. Stay tuned for my over all review tomorrow (if I am lucky) and I apologize for a lack of pictures at the end. Two kids at meals are crazy add the Santa factor and sickness I am lucky I got to eat sitting down! Love the title- jungle chicken crepe!